To change the seatback angle, lean forward slightly and raise the lever located on the outer portion of the seat. Slowly and carefully lean back to the desired angle and release the lever. After adjustment, make sure that the lever has returned to its original locked position. Riding in a vehicle with a front seatback reclined could lead to serious or fatal injury in an accident. 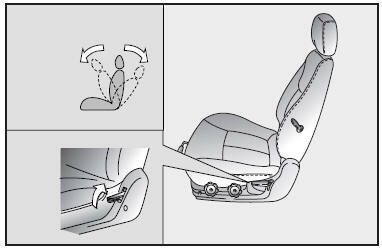 If a front seat is reclined, the occupant’s hips may slide under the lap portion of the safety belt applying great force to the unprotected abdomen. Internal injuries could result. Keep the seatbacks in a comfortably upright position whenever the vehicle is in motion.